At the recent meeting of the US chapter of the Association for Critical Heritage Studies, a frequent question, especially from graduate students, was “what is critical heritage studies”? There was a wide range of responses to this question, often from disciplinary perspectives, which should not be surprising given the very recent arrival of this field of study. While having an answer to this question is important, especially in terms of attracting new people to the field, it would be hubris for me to assume that it is possible to succinctly define critical heritage studies. Indeed, I would argue that the boundaries of the field should remain ill-defined to some extent in order to encourage necessary multidisciplinary and pluralistic perspectives. No singular discipline should “own” critical heritage studies nor should the nature of research in this area be placed into a metaphorical closed box. On the other hand, in order to encourage new people to enter this field of study—especially students—it is important to attempt to describe how others have assigned specific and unique characteristics to critical heritage studies. I will therefore attempt to quickly summarize, via an outline, these perspectives and also do a quick survey of the disciplines that currently dominate critical heritage studies. In my work in critical heritage studies, I have observed the following salient themes, below, that appear to define the field. Note that these are my own observations and others could certainly create alternative themes, but I think this top-level list is reasonably defensible based on evidence from the literature. “[H]eritage [is] a practice that is constructed in the present” (Emerick 2014). Heritage is “constantly chosen, recreated and renegotiated in the present” (Harrison 2013, p. 165). “[H]eritage [is] a production of the past in the present” (Harrison 2013, p. 32). Heritage is how the past becomes “active and alive” in the present (Silverman, Waterton, and Watson 2017, p. 8). Heritage “is always bringing the past into the present through historical contingency and strategic appropriations, deployments, redeployments, and creation of connections and reconnection” (Silverman, Waterton, and Watson, 2017, p. 4). “[H]eritage is used to construct, reconstruct and negotiate a range of identities and social and cultural values and meanings in the present” (Smith 2006, p. 3). “Critical heritage studies is a reaction against the AHD (Authorized Heritage Discourse)” (Smith, Shackel, and Campbell 2012, p. 4) (see Smith  for a definition of the AHD; I also cover the AHD on this site). The negotiation of the meanings of heritage is “a struggle over power … because heritage is itself a political resource” (Smith 2006, p. 281). “[H]eritage is understood as being produced through sociopolitical processes reflecting society’s power structures” (Logan and Wijesuriya 2015, p. 569). Heritage is constructed from “narratives of conflict” (Daly and Chan, 2015, p. 492). Heritage is “about the negotiation of … conflicts” (Smith 2006, p. 82). Heritage “effaces the subtle, personal, contingent practices, expressions, and claims enacted in negotiating both the meaning and content of the stuff of heritage” (Breglia 2006, p. 3). Heritage is “dissonant” (Ashworth and Tunbridge 1996). Heritage is “about a continuing, experimental dialog with the past: ‘process’ rather than ‘product’, and ‘heritage’ as a verb rather than noun” (Emerick 2014, p. 190). Critical heritage studies is a counterpoint to an “epistemological bias towards scientistic materialism” (Winter 2013). “If heritage is a mentality, a way of knowing and seeing, then all heritage becomes, in a sense, ‘intangible’” (Smith 2006, p. 43). “All heritage is intangible” and is negotiated via sociocultural processes (Harrison 2010, 3). Critical heritage studies “tackl[es] the thorny issues those in the conservation profession are often reluctant to acknowledge” (Winter 2013). “The culture of [conservation] practice and the way expertise is used has to change” (Emerick 2014, p. 226); “[T[he emerging field of critical heritage studies can offer … alternative ways of ‘doing’ heritage” (ibid., p. 5). What specializations and expertise tend to be associated with critical heritage studies? I have long observed, though extensive reviews of literature on the subjects of heritage studies and critical heritage studies (e.g., Wells 2016; Wells 2015), that anthropological/archaeological perspectives dominate the published literature. In addition, ethnographic methodologies for gathering and analyzing data are also dominant even though it is possible to use other social science methodologies and methodologies from the humanities (among other possibilities) to answer research questions. This observation is certainly not meant to deprecate an ethnographic perspective, but is rather a way to encourage other ways of knowing that could be incorporated in critical heritage studies. In particular, perspectives from psychology (especially environmental psychology) are nearly absent while geography (especially humanistic geography) and sociology are diminutive voices in the overall discussion. To provide some empirical data to back up my claim, I performed a census of all members of the Association for Critical Heritage Studies (ACHS) that list their position title on the ACHS web site, which should accurately represent their research specialization or expertise. When several areas where mentioned, I only used the first area to avoid duplicate entries with the assumption that the first area mentioned was the dominant one. While one cannot assume that the specializations/expertise of ACHS members mirrors that in the published scholarly literature, I would argue it ought to be a reasonable approximation of reality. 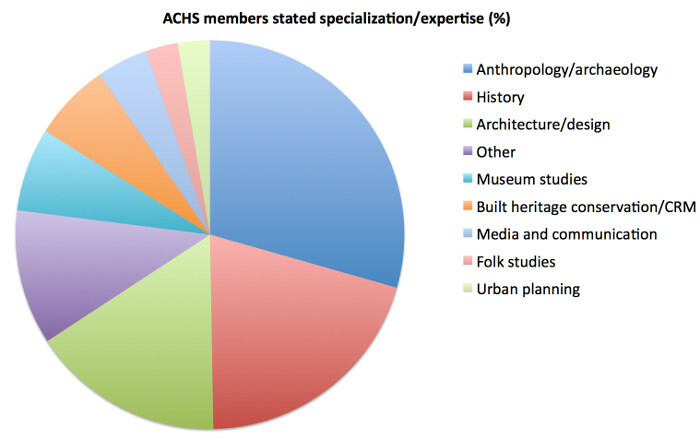 Again, the membership in the ACHS shows the same dominance of an anthropological/archaeological perspective (about 30%) that I have noticed in the published critical heritage studies literature—no surprise there. History is a close second (about 20%) in terms of an area of research/expertise, yet I find no such representation from the discipline of history in critical heritage studies literature defined by the themes above. Indeed, I have found very few scholarly publications written by self-identified historians that are clearly positioned in a sub field of history other than public history (i.e., no representation from art history, social history, political history, etc.) that clearly address critical heritage studies. I challenge my readers to prove my supposition wrong as I would be very interested in how the field of history—which clearly focuses on the past—interprets and incorporates a critical perspective that focuses on the contemporary processes and meanings of everyday people that may have no objective reality in the past. What, therefore, is the practice of historical research that becomes divorced from an objective reality yet does not take some kind of philosophical or post-structuralist detour? I am unable to answer this question. In other words, the literature in critical heritage studies clearly privileges a social science approach or approaches from other areas of the humanities not based on the historical (or interpretive) research method. I fully admit that I come from a naïve perspective because I am not an historian although I have been trained in public history methods, but I would be very interested in how historians who are influenced by critical heritage studies produce scholarship in areas other than applied (e.g., museology) or public history approaches. In other words, clearly a critical perspective could help an historian interpret the past to a contemporary audience, but how would a critical heritage studies perspective directly and fundamentally inform historiography, for instance, or how art history understands the reality of the Pre-Raphaelite movement? I find these questions to be fascinating and would be very interested to know from others of some examples of work like this, if it exists. Or, in a more simplistic sense, are there historians who use critical heritage studies approaches in work that is not centered in public history? Breglia, L. (2006). Monumental ambivalence: The politics of heritage. Austin: University of Texas Press. Daly, P., and Chan, B. (2015). “Putting broken pieces back together”: Reconciliation, justice, and heritage in post-conflict situations. In W. Logan, M.N. Craith, U. Kocke (eds. ), A companion to heritage studies, 491-506. Malden, MA: John Wiley and Sons. Emerick, K. (2014). Conserving and managing ancient monuments: Heritage, democracy, and inclusion. Woodbridge: Boydell & Brewer. Harrison, R. (2010). Introduction. In R. Harrison (ed. ), Understanding the politics of heritage. 5-42. Manchester: Manchester University Press. Harrison, R. (2013). Heritage: Critical approaches. New York: Routledge. Logan, W., and Wijesuriya, G. (2015). The new heritage studies and education, training, and capacity-building. In W. Logan, M.N. Craith, U. Kocke (eds. ), A companion to heritage studies, 557-573. Malden, MA: John Wiley and Sons. Silverman, H., Waterton, E., and Watson S. (2017). An introduction to heritage in action. In H. Silverman, E. Waterton, and S. Watson (eds. ), Heritage in Action: Making the Past in the Present, 3-18. Cham: Springer. Smith, L. (2006). Uses of heritage. London and New York: Routledge. Smith, L., Shackel, P., Campbell, G. (2011). Introduction: Class still matters. In L. Smith, P. Shackel, G. Campbell (eds. ), Heritage, Labour and the Working Classes, 1-16. London: Routledge. Tunbridge, J.E., Ashworth, G.J. (1996). Dissonant heritage: the management of the past as a resource in conflict. Chichester: J. Wiley. Wells, J. C., & Lixinski, L. (2016). Heritage values and legal rules: Identification and treatment of the historic environment via an adaptive regulatory framework (part 1). Journal of Cultural Heritage Management and Sustainable Development, 6(3), 345-364. Wells, J. C. (2015). In stakeholders we trust: Changing the ontological and epistemological orientation of built heritage assessment through participatory action research. In B. Szmygin (Ed. ), How to assess built heritage? Assumptions, methodologies, examples of heritage assessment systems (pp. 249-265). Florence and Lublin: Romualdo Del Bianco Foundatione and Lublin University of Technology. Winter, T. (2013). Clarifying the critical in critical heritage studies. International Journal of Heritage Studies, 19(6), 532-545. Witcomb, A., and Buckley K. (2013). Engaging with the future of ‘critical heritage studies’: looking back in order to look forward. International Journal of Heritage Studies, 19 (6), 562–578. Bookmark this article What is Critical Heritage Studies and how does it incorporate the discipline of history?